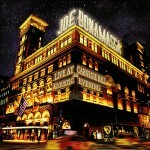 Share the post "Album review: JOE BONAMASSA – Live At The Carnegie Hall, An Acoustic Evening"
Joe Bonamassa’s ‘Live at Carnegie Hall – An Acoustic Evening’ is a successful mid-career sleight of hand. It’s a live acoustic album that recycles mostly familiar material while keeping the career juggernaut moving forward. Being Bonamassa, means it isn’t just an acoustic retread of former glories though, as he explores some intricate visceral moments with a nine piece band that draws on world music influences and makes good use of 3 backing vocalists to bring additional depth to the stripped down arrangements. The end result is an album that flies on the back of several outstanding moments when the wide ranging ensemble uncover moments of real spark and spirit in the unforgiving ambience of the Carnegie Hall. Bonamassa contents himself with focussing our attention squarely on the music – there’s no actual intro until after the ninth song ‘Get Back My Tomorrow’ – and the result is a double set with a linear feel that fully embraces the full potential that his expanded band offers him. On the Danny Kortchmar co-write ‘Driving Towards The Daylight’, a Neil Young style banjo line gives it a rustic feel, before the song builds imperiously and the ensemble taps into some magical chemistry, as Joe shouts out to pianist Reese Wynans to solo, which he does with alacrity. His vocals are more restrained on the Eastern drone of ‘Blue & Evil’ as he gives way to some stirring bv’s before Tina Guo’s cello colours the track with real feel. Given the pre-planning that must have gone into making the huge ensemble an integral whole, it takes a while for the evening to get beyond the picture post card audience feel. However, the emotional distance between the players and the theatre crowd melts away on the meandering sultry sax of the grassy jazz workout ‘Livin Easy’. It’s a number with an after hours feel that might have been worked out as a sound check. ‘Mountain Time’ opens disc 2 as if it was the opening track on a old fashioned double album. It builds up the vibe again on the back of some beautifully nuanced piano and string interplay. Bonamassa adds a stellar vocal which is belatedly framed by excellent bv’s and draws a big response from the crowd. He’s equally good on ‘Song Of Yesterday’, another notable highlight on which the breakdown suddenly takes the song into a different, urgent percussive direction. The whole band coalesces magically on the cusp of a musical wave that gives the evening its flow. ‘Woke Up Dreaming’ is predicated on some feverish cello, acoustic and percussion interplay which emphasizes the song’s dynamic. The whole piece teeters on the brink of a precipice at the 4.40 minute mark, but beautifully unravels itself on another highlight that belatedly brings recognition from the cheering crowd. It’s moments like this that makes all the effort worthwhile, as it’s simply brilliant music delivered live and without a tight rope. Stunning. ‘Hummingbird’ is something of a cathartic release and Joe uses the space to deliver a fine vocal that builds by degrees with his backing singers, though he eschews the big guitar finale to let the song quietly comes to rest as he bids the crowd goodnight. ‘Live At Carnegie Hall – Acoustic Evening’ is a triumph of planning and execution, and re-affirms Joe Bonamassa’s standing in the vanguard of contemporary rock blues. This entry was posted in ALBUM REVIEWS, ALBUM REVIEWS (Mobile), All Posts and tagged acoustic, Carnegie Hall, cello, Danny Kortchmar, guitar, Jethro Tull, Joe Bonamassa, live, Live At The Carnegie Hall - An Acoustic Evening, Neil Young, percussion, Reese Wynans, Tina Guo. Bookmark the permalink.